The long white colored building on the right of the photo is the Base Supply and Administration building (Building 265). To its left is the Consolidated Services Facility, Building 275. Left again, with a low flat roof, is the TESC (Test Engineering Support Center) and Mission Control Center (Building 299). This is the main operations and control facility that overlooks all tests and trials at the base. 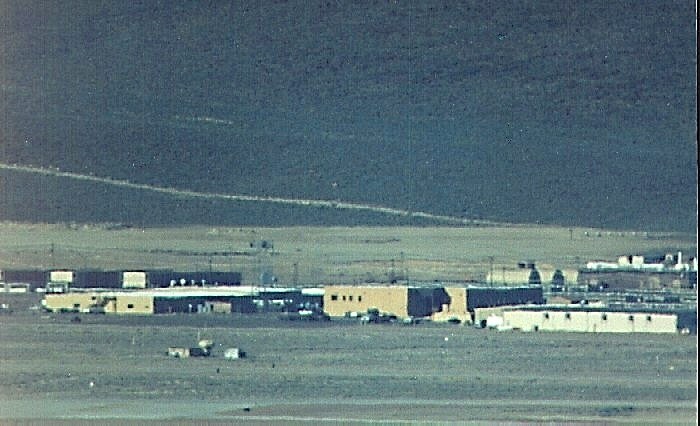 Behind the operations building are some of the Dormitories again, where some Area 51 employees live during the week. The three Quonset huts behind Building 275 are Special Storage Quonsets (507, 508 and 509 from left to right). The large scraped area in the background is where the waste burial and burn trenches used to be. It is pretty obvious from the new satellite images that this area has been subject to remediation (clean-up) activities in recent years. This is probably a result of the lawsuits.